Thanks to Google street view I was able to find a picture of the original sign. When I was little every Tuesday my noni would pick up my sister and me from school and take us to ballet lessons and then to her house for dinner. The ride in her car took us past a very distinctive Mack Truck sign which I am sure I was drawn to because it had a bulldog on it. Sadly that building and the sign have been torn down and replaced with a Walgreens but luckily for me one of my grandfather’s many many talents is that he is an experienced sign painter! 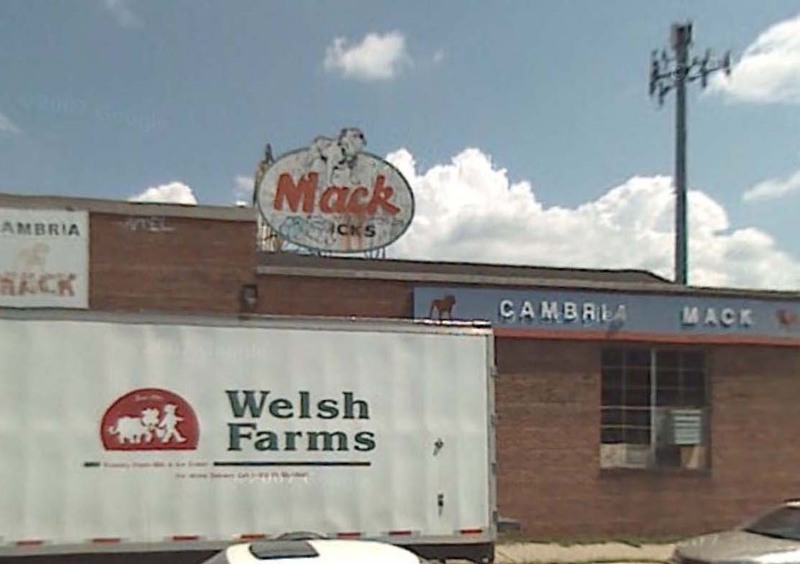 For Christmas I asked for a replica of the Mack Truck sign I remembered so well. He was going to go ahead and make the whole thing for us, but then I had the even better idea that I wanted to have Grandpa teach me how to be a sign painter. The Mack sign just so happened to be the perfect first project. He set about cutting out the shape and giving it a coat of white paint. Over the course of a few weekends I have traced the design onto the sign from a picture we found on the internet and given the whole thing a first coat of paint. I even had help from my dad to paint the dog. It has been great hanging out with my grandfather and learning a new skill. This weekend I got to paint outside and the weather was so beautiful and painting takes just the right type of concentration, it is almost like meditating. Thats such a good idea! Awww. Thanks Grandpa! I love our time together as well.